Fort Mahakan was built during the late 1700s in part to resist a French invasion, one of 14 strongpoints that ran along the perimeter of the island. BANGKOK: Teak chips from pulverized balconies and broken-up floors shower down on workers as they cart out an old TV, a bamboo sofa and a shattered mirror from a house dating back to the 1920s. Meters away, a man wielding a sledgehammer smashes down the frame of a rusting door as dozens of residents look on behind hastily erected barriers. 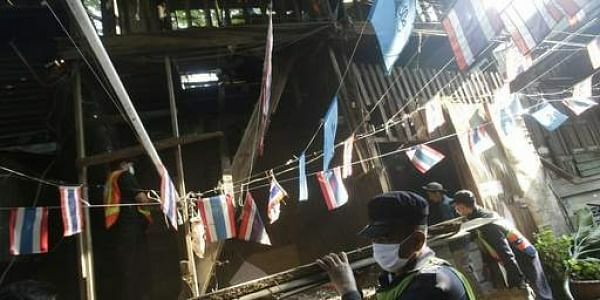 "It's so sad," said Sudjit Sananwai, an architect and longtime visitor to Fort Mahakan, watching as dust rises from splintered wood beams of homes that once belonged to the guards of Thai kings. "People don't understand the value of these houses. They let them demolish everything." Fort Mahakan was built during the late 1700s in part to resist a French invasion, one of 14 strongpoints that ran along the perimeter of the island that defined the borders of old Bangkok. Only one other fort remains; the rest were victims of development. Now just 30 houses within moldy white walls remain here, half the number of two decades ago. Above the houses' worn but well-maintained wooden eaves looms the Golden Mount, with a shining temple perched atop a steep hill. Along one side runs an ancient royal moat, harkening back to an era when Bangkok was called the "Venice of the East," with thousands living in houses stilted above canal waters. The residents of Fort Mahakan have fought eviction for decades, even as city officials have knocked down homes one by one. On Monday morning, dozens of dump trucks and hundreds of officers stood by as city workers marched in to rip apart four more houses. Officials want to level much of the neighborhood and put in its place a grassy lawn — a park, they say, to spruce up the city's historic center. "We want to return this area back to the public," said Jaroon Meethanataworn, deputy secretary of the Bangkok Municipal Authority. "We understand that there are some people affected by this. We've been very flexible so far, but this just can't go on forever." Pornthep Buranaburidet is one of the community's residents trying to fight eviction who have been standing sentry 24 hours a day at the fort's four entrances. "People say they want to make this area look like the Champs-Elysees," Pornthep said. "But we're not Paris; we're Bangkok. We're unique. Why do we have to be like everyone else?" The city is setting siege not just to a fortress, but to one of the last communities in Bangkok to maintain a centuries-old way of life, preservationists say. There are few laws in place, however, to protect historic sites beyond temples and palaces. Fort Mahakan was once home to palace guards and their families. Over the centuries, they left, family by family. Residents today come from mixed backgrounds — some have lived there three generations or longer, some are newer arrivals. Most eke out a living as street vendors. Still, they remain a tight-knit community, proud of the fort's royal roots. Fading photos of widely revered late King Bhumibol Adulyadej are pinned up everywhere. The last palace guard maintained an extensive collection of stamps, clocks and other memorabilia before he moved out a few years ago due to old age. The city government contends the residents are squatters, living there illegally ever since authorities seized the land under expropriation laws in 1992. Some residents accepted compensation to move out, but more than 200 have refused to budge despite years of threats and deadlines. Officials want to build the park as part of a 1978 master plan to conserve and develop the old city. But preservationists believe their plan glorifies monks and kings while ignoring the history of everyday people — sterilizing the past and purging it of any charm that might draw tourists. A Thai architects association has proposed an alternative plan to renovate 24 houses and turn them into a tourist attraction while letting old residents stay, modeled after the preserved hutong alleyways of Beijing. Curators have already put up signs in Thai and English noting sites of interest - a gold melting house and a massage house, among others. "What I'm afraid we're looking at is a vision of Bangkok as a place largely devoid of real people, as simply a monument," said Michael Herzfeld, an anthropology professor at Harvard University and author of a book on the fort. "Mahakan has become a test case. If the authorities go ahead with their current plan, then they will feel that it's OK to do the same thing elsewhere."